The adjustment/mobilization technique is performed by Dr. Rowe to restore normal mechanical movement and alignment to spinal joints which have become fixated or misaligned (subluxated) within the back or neck. These techniques can also be used for any other joint such as a shoulder, knee, hip, ankle or elbow. It is the most important part of a patient’s therapy and is the primary reason why, in most cases, chiropractic is a more effective and less invasive treatment for correcting and maintaining spinal conditions than drugs or surgery. You may experience discomfort or soreness following your initial few adjustments due to stretching of muscles and ligaments which have become short and tight due to the spinal joint fixation and misalignments. This is a normal response and generally should improve within a few days with subsequent treatment. This is a form of muscular and connective tissue stretching performed by Dr. Rowe which may be necessary to achieve relaxation of tight muscles and reduction of muscular trigger points especially in chronic (long standing) conditions. After your condition has stabilized, but as soon as possible, Dr. Rowe will begin you on a form of therapeutic rehabilitative exercise. Active exercise, performed either against resistance (using elastic tubing, hand weights, machines, etc) or without resistance, is a very important aspect of recovery following an injury either from trauma or repetitive strain. Exercises help rebuild strength and condition muscles and soft tissues which have been weakened due to a new or long standing condition. It also aids in neuromuscular re-education of movement patterns which have been disrupted due to deconditioning and lack of use. In our office our patients have the opportunity to rebuild strength slowly to avoid re-injury. A patient can be taken from nonresistive exercise, to resistive exercise utilizing elastic bands and tubing, to full circuit training under the supervision of Dr. Rowe and his staff. When the time is right the doctor will begin you on the type of exercise that is right for you. You will also be shown how to continue your exercises at home to maintain flexibility and strength to help avoid injury in the future. Following through with your recommended exercises is important in being an active participant in your recovery. Electrotherapy is a physical therapy modality utilized to relax muscle spasms, soothe irritated nerves and reduce pain in acute or chronic (long-standing) conditions. It also can be used to help strengthen injured muscles which have been weakened following an injury. Ultrasound is a physical therapy modality utilized in the reduction of inflammation (swelling) in acute conditions, soften scar tissue adhesions and break up muscular trigger points in chronic conditions. Depending how ultrasound is used you may feel either a slight warming sensation or nothing but the slight pressure of the sound head (micromassage) during application of this therapy. Ice pack application or ice massage is utilized to reduce blood flow to an injured area. This will reduce inflammation (swelling) around muscles, ligaments, nerves, and bones to provide relief from acute pain. This treatment is essential during the first 72 hours following a new injury or aggravation of an old one and can be used beyond that time frame. The application of ice is also helpful at the beginning of treatment following your first few chiropractic adjustments. 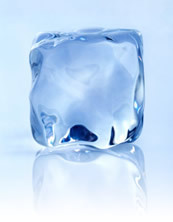 Patients are encouraged to use ice at home during the initial treatment phase at our office. Contraindications to ice application would be vascular compromise or reduced sensation. Moist heat packs are utilized in our office usually in conjunction with electrical muscle stimulation. Moist heat is used to relax muscles by dilating (expanding) blood vessels and increasing blood flow to an injured area. It enhances the effect of electro-therapy when applied simultaneously during onset of treatment of an injury and allows the body to relax during the chiropractic adjustment. Heat should NEVER be applied at home to a new injury during the inflammation stage (the first 72 hours). Although moist heat or a heating pad may feel better initially when applied to an injured area the heat draws fluid to the area causing more swelling to the area and therefore more pain and stiffness may be felt, extending healing time. Contraindications to heat application would be vascular compromise or reduced sensation.